Better late than never! 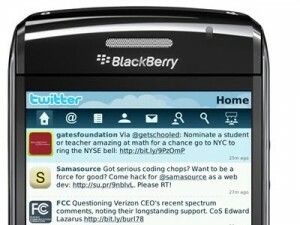 RIM, the Blackberry company announced the launch of the beta of its Twitter application. 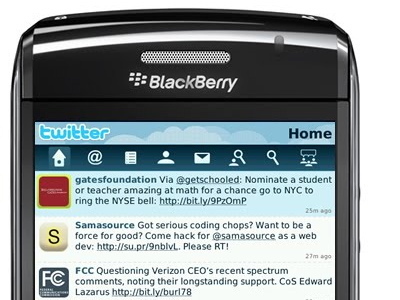 The application will be able to notifies users of new Tweets and be able to reply also. The beta version was launched by Research In Motion for BlackBerry on April 8th expanding the limited access which was since Feb 8th. It has some usual and interesting features that include notifications of new Tweets and reply and also for the tweets to show up on the home screen. Changes to profile can also be done over the phone and pictures could be uploaded. It is available for download from BlackBerry App World and BlackBerry Beta Zone. Here is a list of features are Real-time push of Twitter direct messages, camera and photo gallery integration, browser integration for Tweeting links, customizable interface for changing fonts, inbox integration so you can read your Twitter direct messages along side your email and text messages , @integration so that if you receive an email or text message which includes an @username, twitter lists integration, notification of @mentions, search for users, localized for French, Italian, Spanish, German, and Brazilian Portuguese. Twitter buys Tweetdeck for $40 Million!